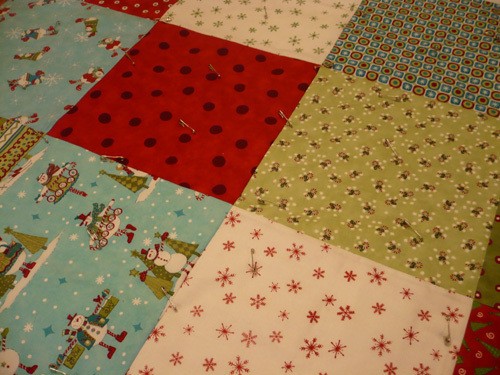 I had a good chunk of time yesterday, so I figured I’d start quilting the Merry & Bright quilt top. 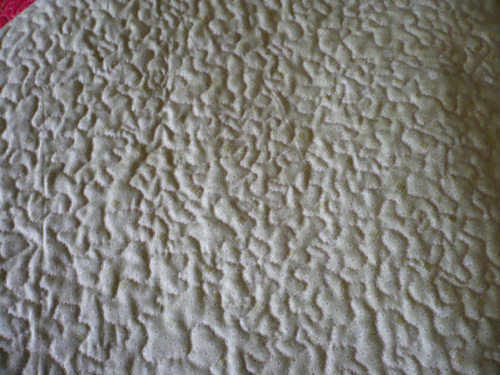 That is until I actually tried to quilt, and my machine started acting funny. It just got back from being serviced, so I figured I was doing something wrong. I re-threaded the needle probably 20 times, but still no luck. Then 30 minutes later, as I was about to give up, I checked the needle…it wasn’t inserted all the way. Operator Error!!! 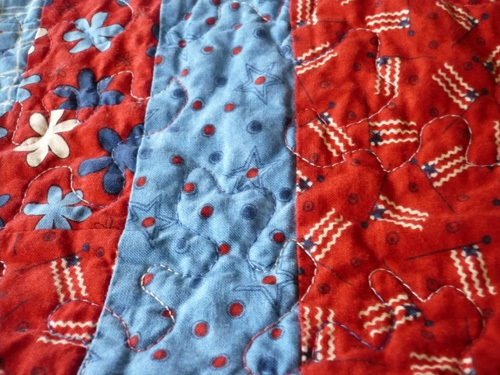 Once I figured out the problem I quilted away, but since it was taking so long I had to put it away and come back to it after the kiddos were in bed. It was taking me so much longer than I thought it would. 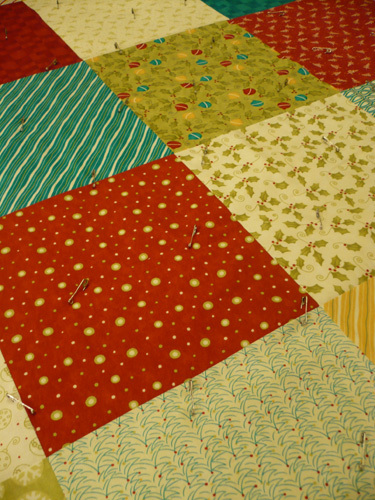 It took me longer to quilt this 57″ square than Ethan’s 67″ x 71″ quilt. 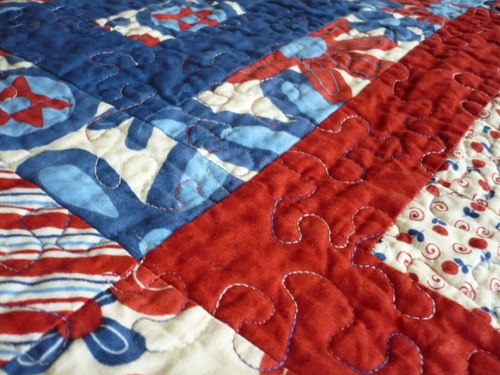 I didn’t think that I was quilting any slower either…in fact I feel like I’ve gotten faster as I’ve gotten more comfortable with quilting. 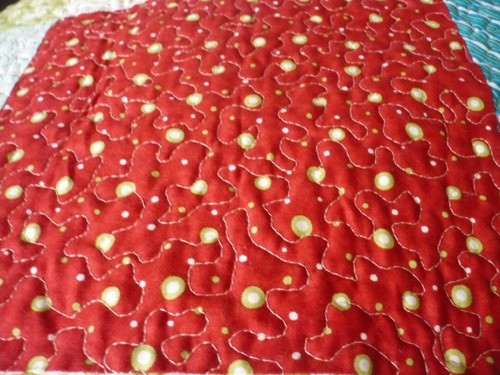 But then I compared the quilting of the 2 quilts and discovered that my stippling has gotten tighter and tighter over time, and therefore, there is far more quilting on the Merry & Bright quilt than on Ethan’s quilt. We are leaving tomorrow for vacation. 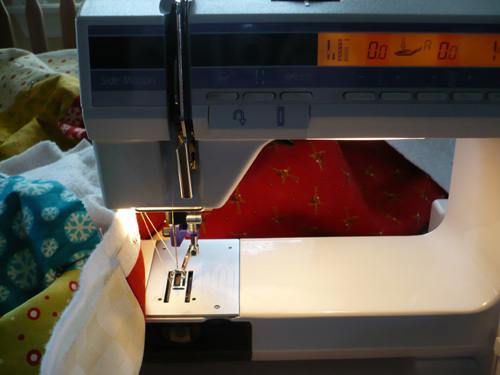 My plan all along was to bring my sewing machine in today for a good cleaning, and since we we would be out of town I wouldn’t miss it. 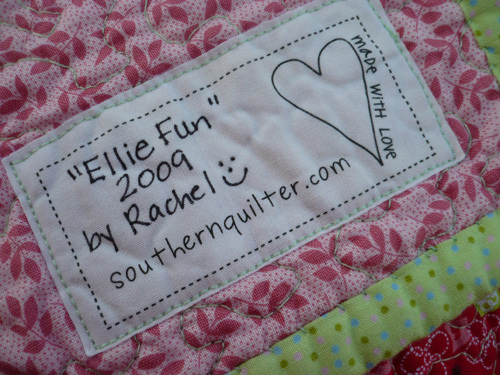 Then yesterday I got the quilting itch. I got out the Ellie Fun quilt top and backing and went to work getting the sandwich together and pinning the whole thing…all by myself. It’s the first time I’ve gotten a sandwich this size together all by myself! 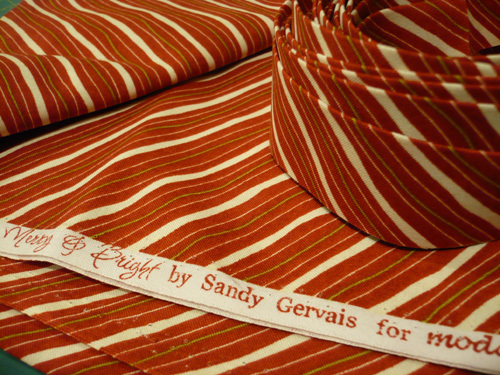 Then I got to quilting. 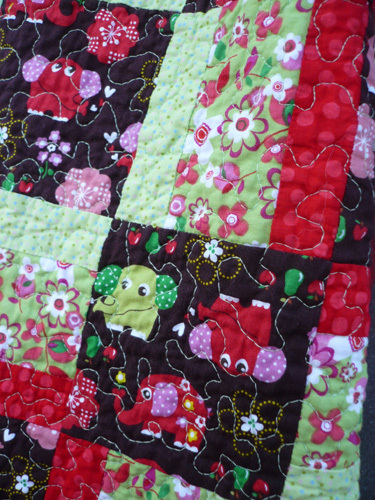 I usually quilt in the evenings after the kiddos are off to dreamland. Uncharted territory here to quilt during the day. Everything was going great (except for the many interruptions to diffuse the “Ellie’s bothering me” or the “TT hit me” etc–must have been something in the air because they were at each others throats all day long!) 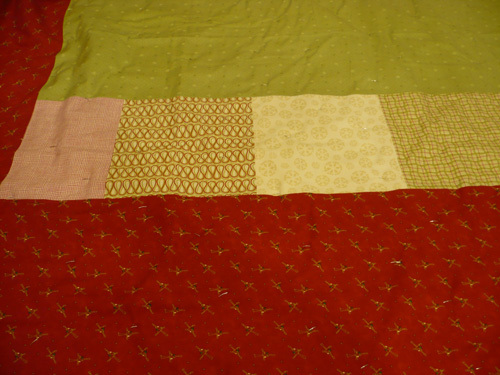 until I was just under halfway done with the quilting, and then my upper tension went crazy. I tried everything I knew, and nothing worked, and I couldn’t even thread the bobbin without the thread snapping when the bobbin was only 1/4 full. So there went my plans (and sanity). 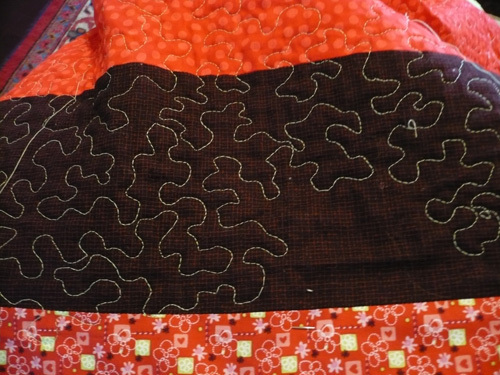 I so wanted to have this quilt quilted, and binding attached, so I could bring the quilt with me and hand sew the binding to the back of the quilt while poolside. Well, it’s just not going to happen. 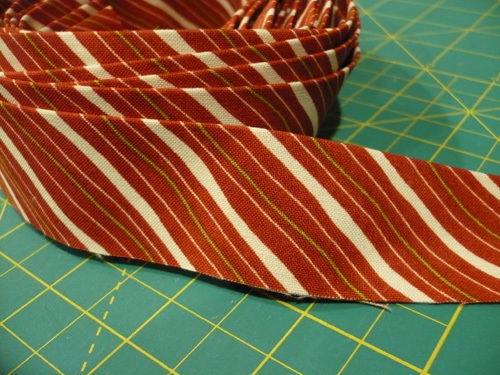 I packed up my machine and brought it to the shop this morning, and it should be all done and ready to finish this quilting project when we get back. 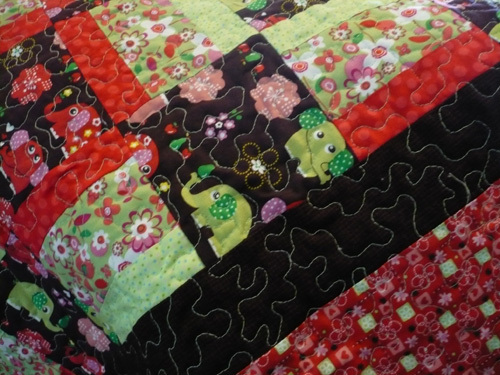 Quilting will resume in the evenings after the kiddos are off to dreamland when we return from vacation. Superstitious? Perhaps. 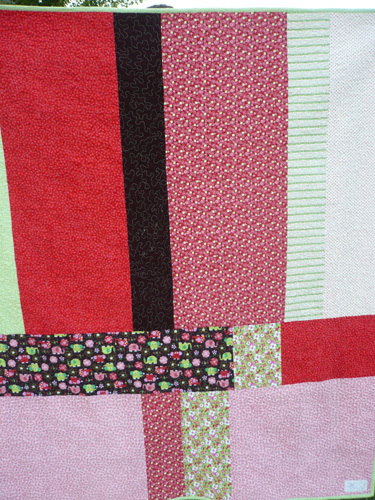 Here’s the first of my winter quilts, and it’s a gift for this upcoming holiday season. 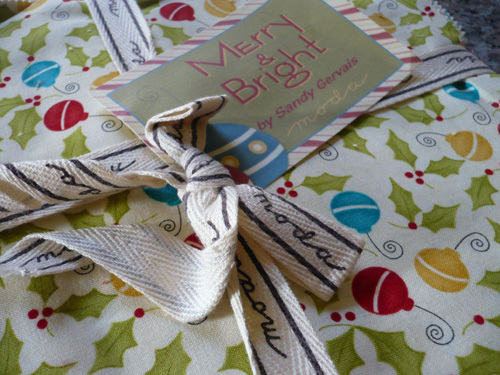 The fabric is It’s Snowing by Deb Strain for Moda. 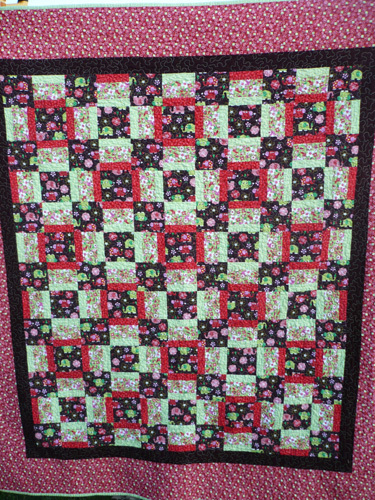 The quilt top and back are pieced, basted, and quilted, and I am now working on hand sewing the binding to the back of the quilt. 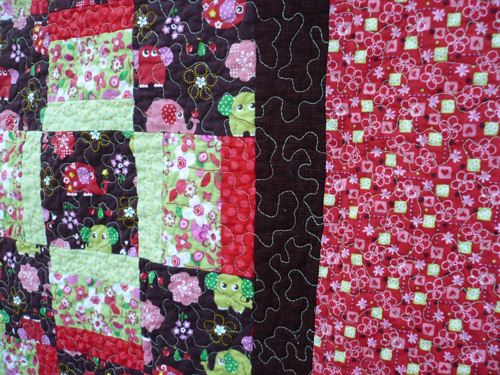 Since this is a gift here’s a sneak peak, but I probably won’t post much about the finished quilt until after the quilt is sent to its new home!